The weather in Argentina is as diverse as the landscape of the country. From the subtropics in the north to the icy glaciers in the south and the windy plains of Patagonia, Argentina spans a host of climatic zones. 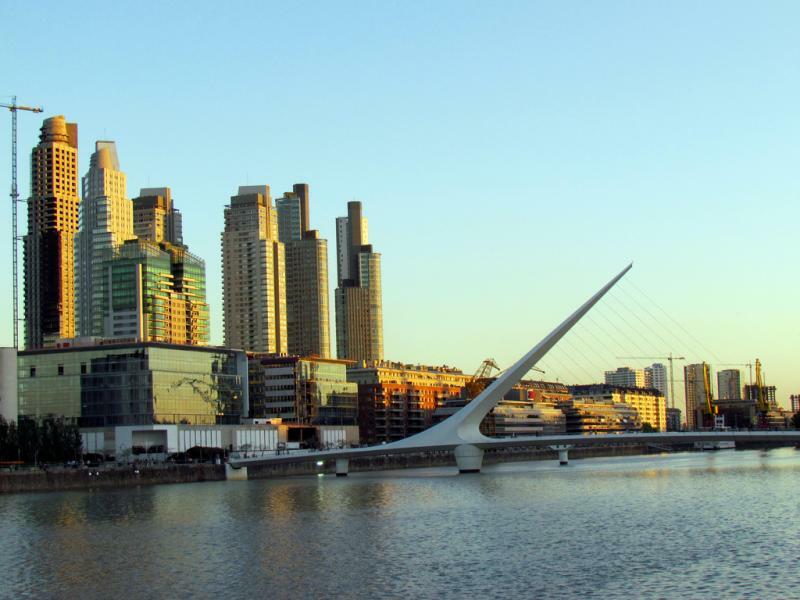 The capital of Argentina, Buenos Aires, is situated in centre of the country. It has a temperate climate with a southern hemisphere climate pattern. Summer lasts from December to February, and winter spanning from May to September. The climate in Argentina is diverse and perfect for those wanting a beach holiday or for visitors in search of an Antarctic adventure. Average temperatures in summer in Argentina can differ quite dramatically depending upon whether you’re in the north or the south of this South American country. Summer temperatures in Buenos Aires range from 15 to 30 degrees Celsius (59 to 86 degrees Fahrenheit). Daylight hours in summer range between thirteen hours per day in October to fourteen hours per day in November, December, January and February. Winter temperatures in Buenos Aires drop to between 7 and 17 degrees Celsius (45 to 63 degrees Fahrenheit) from late May to early September. Average daylight hours in winter range eleven hours in early and late winter, and ten daylight hours each day in mid-winter. Summer is the rainy season in Argentina. The months from October to April tend to experience a monthly average 100mm (4.0 inches) of rain. The rainy season also experiences moderate humidity levels. Winter in Argentina is also the dry season. Frost is common during June and July, and the southern and central regions sometimes experience snowfall as well. High winds are common throughout Argentina, particular the winter winds which have individual names. The chilly ‘pampero,’ wind blows across Patagonia from the Polar Regions in the south. The ‘pampas’ wind is a northerly wind known to blow away cold fronts. While the ‘zonda’ is a warm and dry wind that blows across the western areas of central Argentina. Argentina’s vast topography and climate makes choosing the best time to visit slightly more complicated. Winter, in June and July, is the perfect time to visit Argentina for a skiing, however July is also winter break in Argentina and prices often rise considerably. Visitors in search of a beach holiday should plan their trip for summer in Argentina from November to March. The southern regions are great during summer and spring, particularly visitors to Patagonia and Tierra del Fuego for trips to the glaciers. The Argentine summer holiday period falls in January and February, which often means popular resorts and holiday destinations are fully booked or overrun with tourists. The first rule is to pack according to area; just travelling to Buenos Aires will require different clothes than a trekking, skiing, or beach holiday. Buenos Aires is quite elegant, so wear smart, fitted clothing. In general, a light coat, thermals, leggings, a warm jersey or two and some long sleeved shirts will suffice for any time of year and for trekking excursions; in addition, sturdy hiking boots, amphibian walking shoes, sandals, sunglasses, sunscreen, sunhats and warm hats, gloves and scarves are also recommended, especially for the countryside. Beach holidaymakers should take a change of swimwear, light covering and sunglasses, sunhats and sunscreen. Remember to be sensitive to national sensibilities, especially around the Falklands area– no bulldog shirts, English rugby vests or Union Jack bags. Finally, Buenos Aries has one of the most vibrant nightlife scenes in South America, so take smart-casual clothing along for a special night out. Events: Argentina is home of ‘the beautiful game,’ in January the popular soccer stadium, Cancha De Boca, in Buenos Aires gets packed to capacity for football season in Argentina. Note: 1 January is a public holiday and most shops are closed as people recover from New Year’s festivities. Events: Argentina is the home of the tango, and the Argentine Tango Festival celebrated in February and March is a must. Visitors to Argentina in February can attend the annual Tango Festival and take part in lessons, demonstrations and shows, particularly along Buenos Aires’ Corrientes Avenue. Events: The Tango Festival in Buenos Aires is one of the most popular events in March in Argentina. Note: 24 March is a national holiday, Truth and Justice Day. Note: 2 April is a public holiday in Argentina for Malvinas or Veterans’ Day. Note: 1 May is a national holiday in Argentina for International Workers’ Day. 25 May is the annual Military Parade in commemoration of the May Revolution of 1810. Note: 15 June is National Flag Day, buildings and even some cars are adorned with the Argentina’s flag. Note: National Independence Day falls on 9 June annually; parades and celebrations are the norm. Note: 17 August is San Martin Day in Argentina, it commemorates the death of one of Argentina’s most important founding fathers: José San Martín. Note: Race Recognition Day on 12 October is a national holiday in Argentina. Note: December is a low-key month as far as events are concerned. There are two national holidays in December in Argentina. Immaculate Conception Day on 8 December and Christmas Day on 25 December. December is a month of family and religion. For a good choice of hotels with discount prices, visit Where to stay in Buenos Aires for more information.